Since 2016, writers at 10,000 Birds have been contributing checklists to a joint eBird account called the “10,000 Birds Collaborative.” Every month, Redgannet summarizes the checklists, providing an updated life list, year list, and country list. For the United States, there is also a state list. Note that the collaborative list only includes checklists during the writer’s tenure as a contributor, so checklists before or after that time do not count. The writers at 10,000 Birds span the globe, but I am particularly interested in the lists for the United States, as that is my “beat.” The 10,000 Birds Collaborative has a profile page that provides interesting information and, like all eBird profile pages, suggests some goals. Unsurprisingly for a site founded and run by two New Yorkers (one of whom literally wrote the book on birding New York), the Empire State boasts the highest number of species (316). California (297) is next, followed by Florida (227), Oregon (209), and New Jersey (199). After those five, there are relative handful with over 100 species: North Carolina (172), Michigan (159), Arizona (155), Washington (144), North Dakota (141! ), Virginia (122), New Mexico (112); Texas (106); Colorado (106), and Pennsylvania (102). Inexplicably, eBird does not consider Puerto Rico part of the United States, but if it were properly included (Puerto Ricans are U.S. Citizens), it would do well, with 107 species. 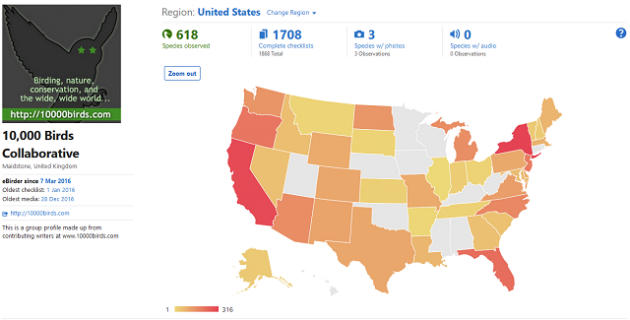 Many of the states with more than 100 species are home to contributors and/or have destination birding locations and/or are popular places generally. Some are all three (e.g., New York, California, and Florida). However, most states have less than 100 species, including: Missouri (98); Wyoming (97); Delaware (83); Massachusetts (81); Maine (76); Louisiana (73); Maryland (62); Idaho (57); Georgia (54); Nevada (53); South Carolina (49); Vermont (34); Alaska (34); New Hampshire (31); Indiana (27); Kansas (23); Tennessee (17); Ohio (16); South Dakota (14); Montana (11); Arkansas (8). Even some states that technically have checklists barely qualify: the great state of Illinois has just a single checklist with two species (from an airport). Despite the absence of species, many of these are excellent birding states and/or have birding festivals (e.g., the Biggest Week in American Birding in Ohio). Some states have no species at all, not even a pigeon, crow, or sparrow: Hawaii, Utah, Nebraska, Oklahoma, Minnesota, Iowa, Wisconsin, Kentucky, West Virginia, Mississippi, Alabama, Connecticut, and Rhode Island. Even the nation’s capital has been ignored. Many of these “missing” states have few checklists overall, so the Collaborative is fairly representative in that respect. For example, as to checklists, Kentucky ranks 38th in the U.S. (out of 51, including Washington, D.C.), West Virginia ranks 44th, Hawaii ranks 45th, and Rhode Island ranks 48th. In contrast, the Collaborative has checklists from virtually all of the 20 states with the most checklists. Many of these “missing” states are in the Midwest or deep South, far from most of the writers. (However, that’s not the case for others, such as Connecticut or Rhode Island.) Thus, like all things relating to real estate, the most important factor is location, location, location. Naturally, the “missing” states implicitly suggest birding trips, as every “empty” state provides excellent birding opportunities. For example, my list of the Top 25 National Wildlife Refuges for birding includes locations in Utah (Bear River MBR), Minnesota (Minnesota Valley NWR), and Wisconsin (Horicon NWR). Not only does Hawaii have surf and sun, it has a Top 25 NWR (Kilauea Point NWR), plus many endemics. And so on…. Birding provides endless opportunities to see birds in their varied habitats across the United States (and the world) and the writers of 10,000 Birds will surely enjoy filling the remaining states on the map. 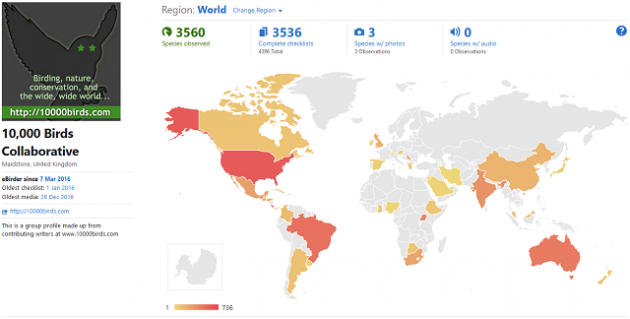 Of course, the Collaborative will also continue to work on the global map (below) as well. Welol, Heck, I am not that far from Utah, and now that I am done with Costa Rica……..who know where we might end up, and if we can get Utah off the snide, it just might be a future road trip! I am hoping that your post will provoke a renewed effort from the beats. Just took a quick snoop around in Chicago to boost the Illinois list. Alabama was a simple excercise in colouring the heat map. We visited Elvis, then nipped across the border for dinner and a bluebird. I think I added two states (Alaska and Kansas) to the Collaborative list and hope to get to some new states eventually. Wow, I had no idea I was adding the inaugural Illinois checklist for the collaborative when I was at MDW last year. Had I known, I would’ve tried for something better than a two-species airport list!